I remember being 10 years old, lying on the ground in the middle of my small town at a peaceful protest. My family had been part of the demonstration, and I was certain that all our work was going to pay off. Somewhere in the halls of Washington, politicians were going to see how sad the American people were and change their minds. They’d certainly turn the planes around, send our soldiers home. We had just been in Washington, D.C., marching against the war in Iraq. I remember walking down the street, towering adults on either side of me as we walked with purpose, the nation’s capital in our sights. Surely they will listen, I thought to myself. Surely everything will be all right. Now at 26, two wars and four presidential terms later, I’m feeling a lot of the same feelings. 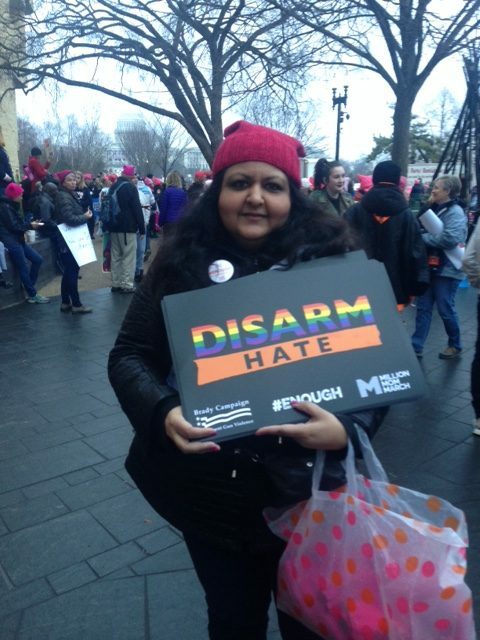 Both helpless and hopeful, I’m in D.C., marching with my family who walked beside me when I was ten. I’ve grown up and yet feel completely bowled over by an election and a presidency that, in its darkest moments, makes me feel like a scared little girl. 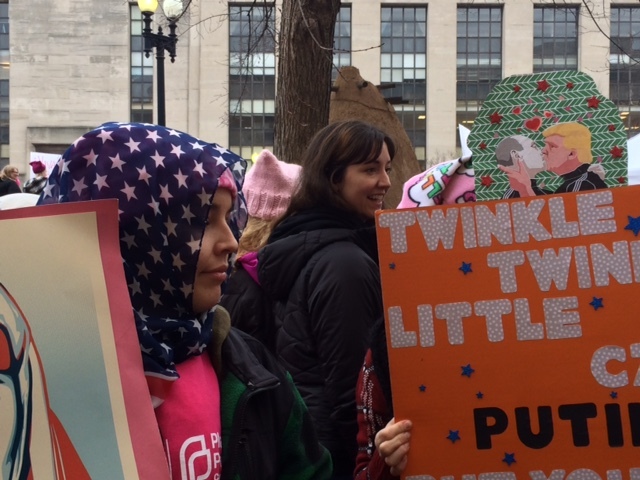 At the Women’s March on Washington, I can’t help but thinking… Surely the government will listen. Surely everything will be all right. But I now know things don’t quite work like that. No matter how hard you close your eyes and wish, protesting doesn’t create some sort of instant gratification where everything is instantly okay because you did your civic duty. It’s a daily struggle to be a good citizen and have your voice heard, and change doesn’t happen over night. 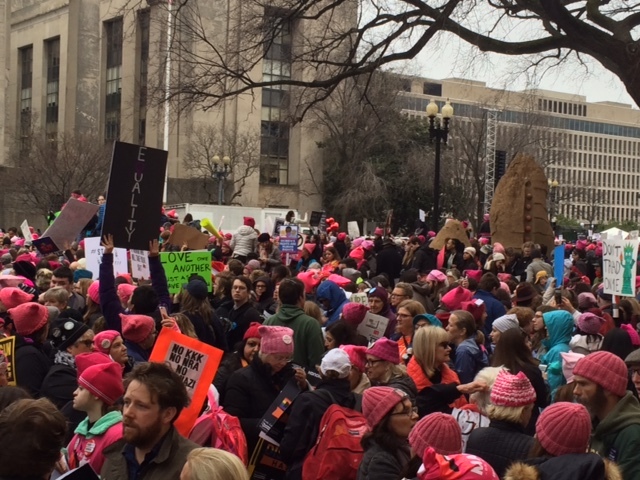 That being said, the Women’s March on Washington was a revelation. 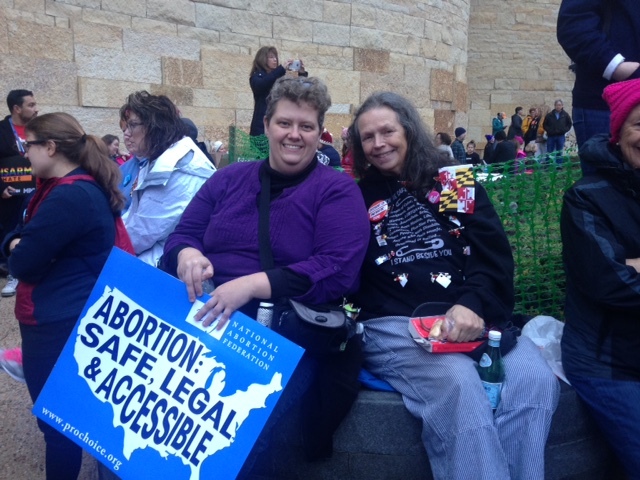 After all the hateful words and fear that the election brought to much of the American population, it felt so good to be among people who were dedicated to love, peace, and caring about others. It felt fantastic to be sitting on a train and see people of all ages and backgrounds striking up conversations with each other, smiling and laughing. Seeing people grabbing stranger’s hands and helping each other up over barricades, through a crowd, or to the best pizza restaurant was incredibly refreshing. 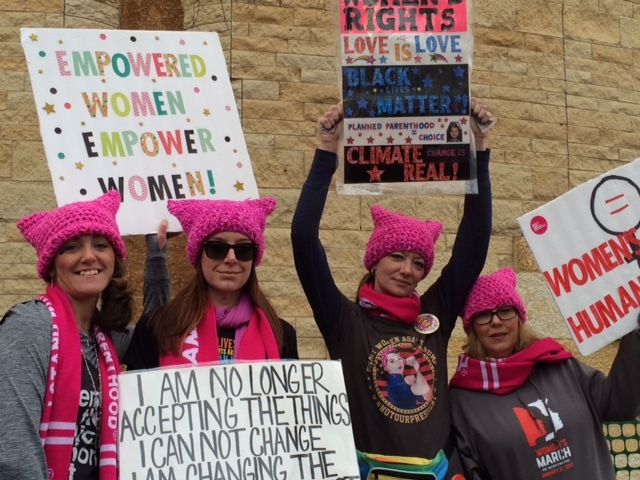 It was amazing to be a part of a large group of people screaming our heads off for inspirational speakers like Angela Davis and Gloria Steinem as if they were The Beatles. To be simply put, it felt amazing to be surrounded by people who cared about other people. 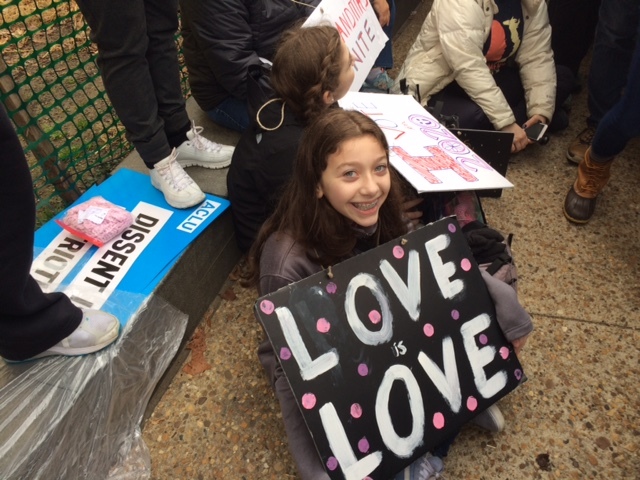 From little kids to law enforcement, grandparents to whoever was standing next to me at any given moment, the entire march permeated kindness and compassion. Here was a group of people dedicated to protecting each other from those that would like to see us scared, divided and turning on each other. Here was a group of people sharing sandwiches, cracking jokes in the line to the bathroom, and befriending strangers. And the best part? There were so many of us. Everyone I looked I saw more people. 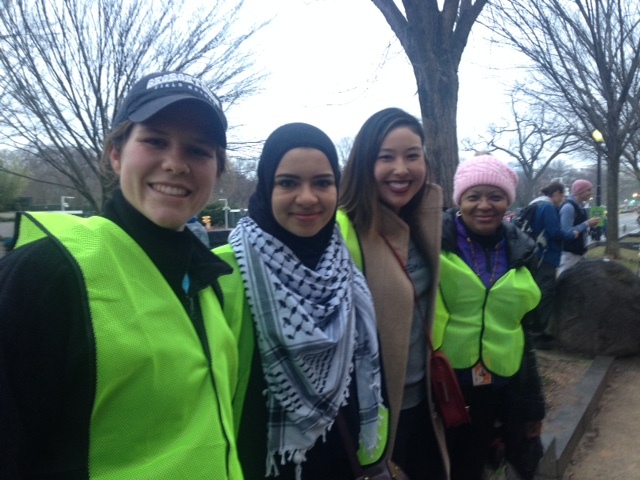 We had literally taken over Washington with love, kindness, and peace. I suddenly felt bowled over in a different way. I was blown away by how much we as Americans actually love one another. And when I say Americans, I mean everyone. Women, people of color, immigrants, the LGBTQ community, people with disabilities, veterans, the elderly, little kids, and men who don’t want to see the population afraid — we are the majority of Americans. Anyone trying to break us, tear apart our families, take away our rights or make us afraid is in the minority. That is the most important thing that the last couple months had caused me to forget. We, the majority of Americans, are so much bigger and more powerful than the people that want to make us feel scared and powerless. And that is the terrible, insidious thing about fear. It worms its way inside of you and makes your world seem so small. Fear will stop you in your tracks, make you not believe in yourself, and, even worse, not believe in other people. We cannot allow fear to win. We, the majority of Americans who love each other, are dedicated to progress, and care about strangers we’ve never met or never will meet, need to stick together. Our compassion, dedication, and teamwork is our legacy. Being side by side with such a wonderful group of individuals made me realize that I’m not afraid because I’m not alone. Love will win, but only if we fight for it. So speak out when you see injustice, dedicate your time and talents to worthy causes, and get to know and fight to protect your neighbors and strangers alike. That is not to say it’s going to be easy. If I’ve learned anything from the last couple months, it’s that we’re going to run into a lot of unwelcome surprises that will test our mettle. Some days it’s going to make us feel numb. Other days it’s going to make getting out of bed and going outside feel as feasible as hopping in a rocket ship to Mars. These are tough times. But we’ve got each other. Fighting with radical love and kindness for one another is the only way we’re all going to get through the next four years. That might sound scary, but I for one am not scared anymore. I’ve got you guys on my team, and I know we can do it.